Rogue and Iceman get a flat tire! Psylocke and Archangel work out! Gambit wakes up! Sabertooth goes for a walk! Graydon Creed makes a speech! And if that wasn’t enough Gene Nation takes over a morgue! Iceman and Rogue continue a trek across the Americas after she accidentally left Gambit in a coma thanks to a kiss. At the mansion Gambit interrupts Psylocke and Archangel’s training in the danger room before collapsing, Elsewhere Storm breaks up a tussle between Wolverine and Cannonball over the seemingly vegetative Sabretooth. 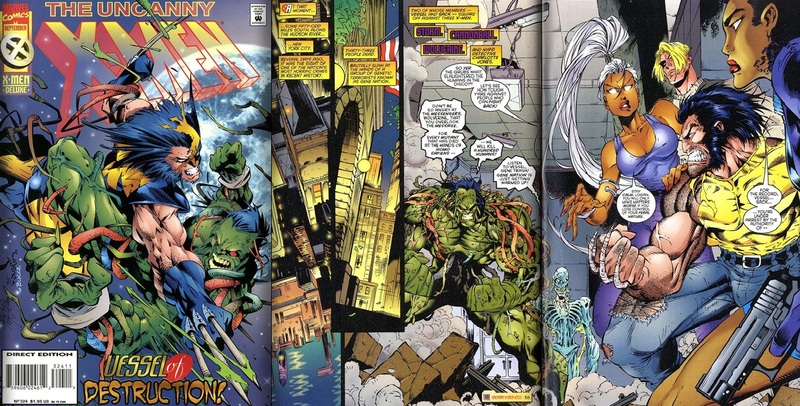 Joe Maduiera turns in a lovely cover featuring Storm, Wolverine, Cannonball and two Gene Nationals: Vessel and Glass. Even by today’s standards these deluxe X-men covers are still stunning, with dynamic colors that stand the test of time. 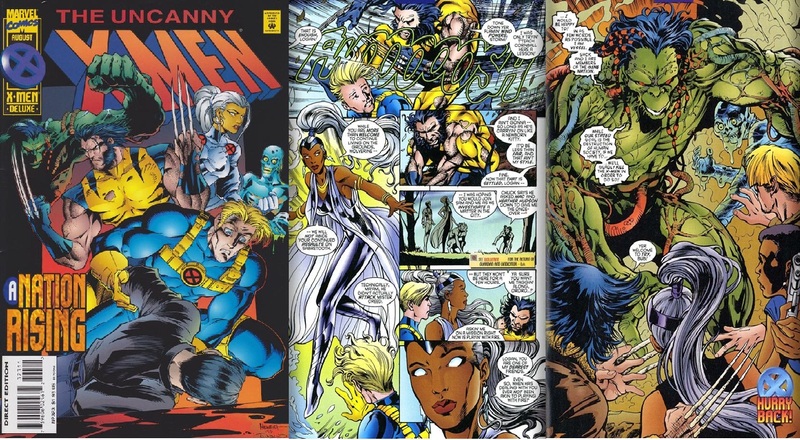 This begins a small X-men line crossover which celebrates the anniversary of the Mutant Massacre which leads to Storm donning a new costume and a slightly more edgy personality.Storm and Charlotte Jones are the stars we get this issue. Charlotte is my favorite detective in the marvel universe and the Archangel breakup is forever hanging over her head. Good times! On the bad side Compared to the cover this issue was a travesty in the art department and good god how did we read comics with this much exposition in the 90’s? Round one between the Morlock’s Gene Nation Begins! Also Psylocke takes a telepathic stroll inside Gambit’s Mind! In Gambit’s mind Psylocke tries to discover his secrets, he discovers her first however and kicks her out of his mind. Elsewhere Vessel and Sack attack Charlotte, Storm, Wolverine and Cannonball. They manage to defeat the villain but they still escape. Elsewhere Ice Man calls Emma Frost and Rogue continues her trek across America.